Atlas and the Anchor: Belle Adair - "The Brave And The Bold"
The Muscle Shoals, AL based folk-pop band Belle Adair recently released their highly-anticipated debut album, The Brave And The Blue via Single Lock Records after self-releasing their very promising self-titled debut EP in 2011. The band, led by singer-songwriter and guitarist Matt Green - with his inviting vocals that recall that of Eric Johnson of the Fruit Bats - create crafty folk rock arrangements that incorporate catchy power-pop melodies and rootsy country & western ornamentation with hints of ethereal synth-driven atmospherics. “Be Brave” opens the album with ambient washes of eerie noise that sets the scene for the contrastingly less harsh cascading guitars and wispy pedal steel of standout track, “Sister”. The churning, psych-leaning “Slowest Routine” follows with an unhinged Nels Cline-like guitar solo. “Unwelcome Guest” features a loping, slow waltzing beat with tinkling piano, close knit harmonies and some aching pedal steel for another standout moment. “Clouds Never Break” continues with the slower pace and sullen melodies, set to cyclical acoustic guitars. Next, “Golden Days” sounds like early Wilco with swells of rafters-reaching organ, chiming guitars and some swaying melodies. The Gospel-soaked “Easy Way Out” is filled with vintage organ provided by keyboardist Ben Tanner, a touring member of the Alabama Shakes, who also engineered and mixed the album and co-owns Single Lock Records. The jangly guitars, bright horn section and laid-back vibe of the single, “Losing My Train” stands out with an early 90’s college rock sound. Later, “Comes A Time” deals with issues of trust and love but seems to find a glimmer of hope by the end with pretty, complementary female vocal harmonies. The ten-track album closes out with the gorgeous violin and horn-adorned arrangement of “The Search”. 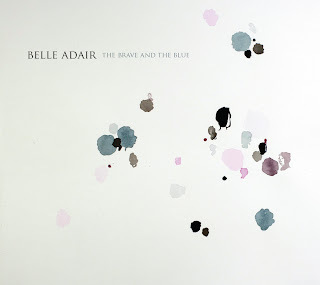 With their excellent debut album, The Brave And The Blue, Belle Adair are a band on the rise. Catch them on tour now.